Are other religions just not satifing your need for spirituality? Has your faith left the standard church doctrine? Well I have an answer. 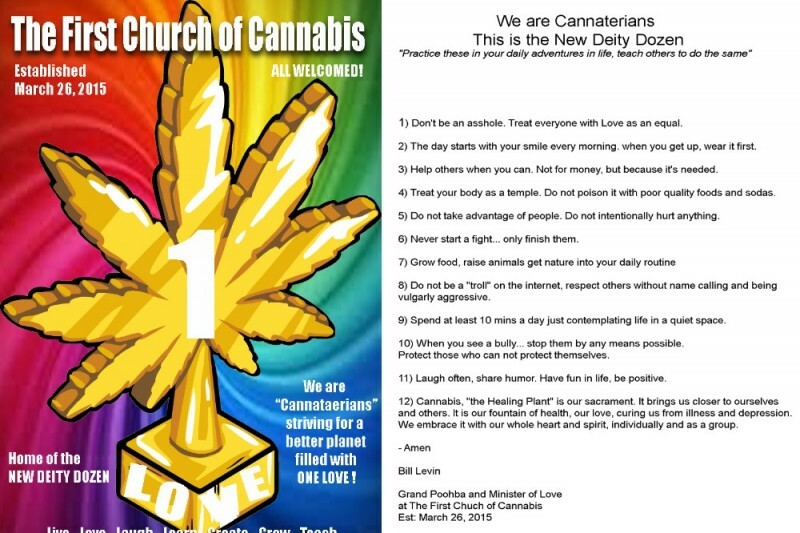 I have created the FIRST CHURCH OF CANNABIS. A church based on LOVE and FAITH with the plant we know and love. Please join me in building a better spritual future for all. This fund raisng campaign is to lease us a church for a year until we can break ground and build America's first HEMP TEMPLE celebrating all that is good in our hearts. We all have faith. Let's cherish it togehter under the roof of LOVE. A Private anonymous donor just donated us $1000. I am in tears of joy. Folks we are gonna have a Church sooner than expected at this rate. ONE LOVE!..... with a SMILE! WOW... we made $880 towards our new Church lease. BLESS YOU ALL! THANK YOU for your donation to help us build a new home for all Cannaterians, The First Church of Cannabis! You Rule! Reading through the comments I noticed several folks doubting good ol' Bill. I would like to offer my opinion (as a prosecutor from Georgia...really). No, not an opinion about cannabis as the basis of a religious movement, but about Bill. I heard about the church last week, but I did not know that Mr. Levine was running the show. Now I haven't seen Bill in over 15 years (moved to Atlanta in 2000 after attending law school in Indianapolis), but I did know him back then...and I can assure you that he is on the level. Bill Levine is one of the most unique individuals that I have ever met, but I can absolutely see him doing this for real. He has attorney friends (good ones...hi Terry) in Indianapolis that could steer him through the government process of establishing a church. I wish all you guys the best. Good luck Bill!!!! Sigh... Tina... You need some spelling and grammar lessons. How are you going to call some one dumb when you can't spell or make out a coherent sentence? It's ok we all still love you. I'd really like some more information before I make a large donation, such as where the money is going to be put; location. Just more details. Maybe you are in need of ideas even. I had sent a message to the First Church of Cannabis facebook page. My contact info there. Thank you. This is such a sweet twist on that "questionable" law that has since been redone. Congratulations Bill, for your always forward thinking and ability to turn lemons into lemonade. Every State in the Union requires a hundred guys like you. This sweet and generous plant would have been legalized decades ago. Keep up the good work. Long may you wave, old friend. David and I will support you in any way we can. I want to be high priestess..and am willing to do whatever "legwork" I can...mailers or whatever...a plant should never be called illegal. I truly hope that short sided and sometime well meaning people do not interfere because they eather wont take time to learn the truth of cannabis or even entertaine the idea that people can come together with a common goal and celebrate true freedom from persecution where canabis is involved . Why has the churches Facebook been down during holiday weekend? come to washington state to build your church !